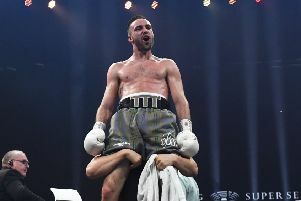 Scottish 56kg champion Lee McGregor has revealed how he has been preparing to retain his title next month by training alongside IBF world heavyweight champion Anthony Joshua. The Meadowbank amateur, who is also part of the GB set-up based in Sheffield, will attempt to overcome his first hurdle at Ravenscraig Sports Centre in Motherwell on Saturday. Should the 20-year-old prevail, he will be back in North Lanarkshire next weekend for the semi-finals and, all being well, will again head west for the final on Saturday, April 1. Despite having undergone surgery to repair a bone in his right hand in November, an injury he sustained at the Tampere Tournament in Finland where he won silver a couple of weeks beforehand, McGregor has been back at his South Yorkshire base rebuilding his fitness in the company of Joshua who is just seven weeks away from his world title showdown with Wladimir Klitschko at Wembley Stadium. “Joshua is always in Sheffield so it’s been amazing to be training with somebody of that calibre,” McGregor said. “You can only be inspired. He does a lot of things himself but the GB head coach Rob McCracken is also his trainer so we get put through a few things with him. He really is an absolute tank! He’s also offered a few of us tickets for the fight against Klitschko so that would be amazing. “But I just need to focus on myself as I’m desperate to win gold again as that will give me a lot of points towards trying to secure my place for the Commonwealth Games next year. I’ve been training hard but I’ve been held back with my hand a bit. It didn’t heal as quickly as I had expected but I’ll be fine to give it my all this weekend.